A capacity crowd of teachers, administrators and family members filled the Sheldon Hall Ballroom to capacity Wednesday morning (June 11) to congratulate graduates of the Oswego County BOCES New Vision Program. 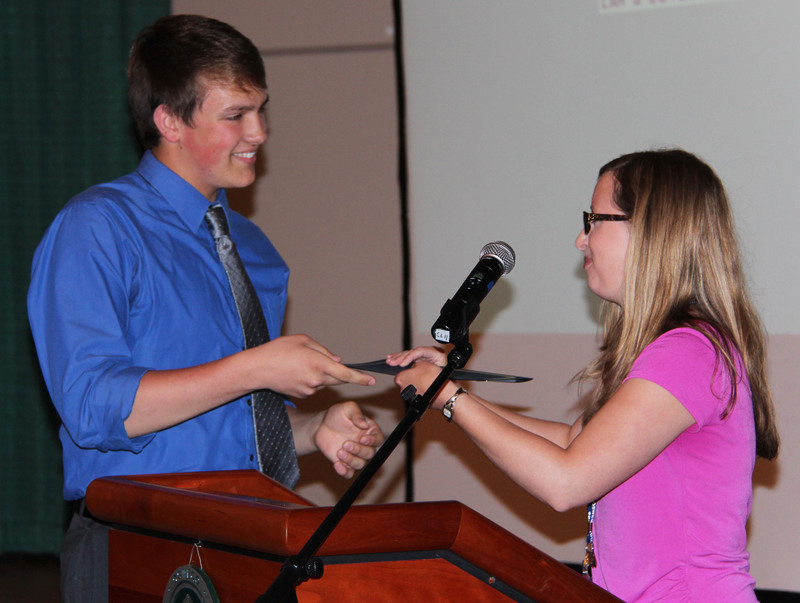 Oswego County BOCES New Vision Allied Health instructor Kim Wright presents Evan Davis, of Oswego, with the Eileen Ponto Scholarship. The year-end ceremony recognized nearly 80 students who completed one year of study in the OCB New Vision Allied Health, Law and Government, and Specialized Careers programs. Each offering provided high school seniors with a chance to explore different career fields, with classroom learning coupled with twice-weekly rotations at various sites across the county. “Journalism, education, health, law and government, veterinary science … what these kids are able to experience is more than many of their peers or even college students experience,” said New Vision team leader Dianna Nesbitt. Student speaker Meghan LiVoti, of Oswego High School, echoed those sentiments. The experiential learning that defines the New Vision program has a lifelong impact, as Oswego County Clerk Michael Backus attested to during his remarks. Backus attended the New Vision Law and Government program in 2002, and many of the people he worked with at that time are now his colleagues. During the Oswego County BOCES New Vision reception Wednesday, nearly 80 graduates express their gratitude for the people in the audience who helped them along the way. The partnerships that BOCES has forged with local businesses, service providers and government agencies has been a critical component in the New Vision program’s longevity and success, said OCB Career and Technical Education Principal Marla Berlin. 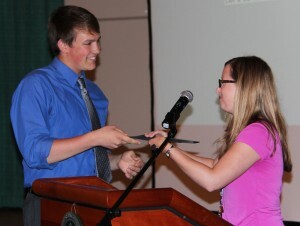 In addition to recognizing all the graduates with a certificate of completion, several students earned special honors. The Eileen Ponto Scholarship was presented to Evan Davis, of Oswego, who is pursuing a post-secondary career in the health field. The Most Improved Awards were presented to Selena Craw (Mexico), Kerrigan Holley (APW), Cassondra Horridge (Pulaski) and Elaine Powers (Mexico).